1978's Dawn of the Dead, George A. Romero's sequel to his 1968 horror fest Night of the Living Dead, is often remembered as the best of Romero's work and is always remembered by its tagline "When there is no room in Hell, the dead shall walk the Earth." It may not be a "true" sequel, and it is not Romero's best work by far, but there is no doubt that Dawn of the Dead picked up where Night left off and pushed the envelope of movie gore and horror farther than any had dared to at the time. 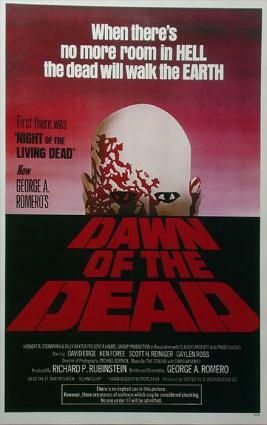 With Night of the Living Dead, Romero created a new sub-heading in the horror genre and called it the zombie movie. It was effective on a number of levels because the enemies, the monsters if you will, are us. Anyone you know, whether it's your grandmother, favorite uncle, your mother, or even your children can become one of the Living Dead and attack you with murderous intent. Dawn of the Dead is not so much a sequel to Night as it is a mere continuation of the genre Romero created. None of the original Night characters are present (they all died in the original), and the setting is different. The only constant is the horde of undead zombies stalking the living. Romero plays the gore card with the effectiveness of Chris Moneymaker holding pocket aces in The World Series of Poker. Ten minutes into the movie, we see a man shot in the head with a high-powered shotgun, resulting in the first cranial explosion ever shown on American screens. "If we did that in the first ten minutes," Romero says in the Dawn DVD commentary, "the audience is immediately wondering what they're in for." If Night of the Living Dead presented a message of revolutionary upheaval, Dawn of the Dead is Romero's stark commentary on American consumerism. The plot revolves around a small group of people (two AWOL SWAT team members and two employees of a local television station) trying to escape the chaos of the zombie epidemic by fleeing in the station's traffic helicopter and seeking solace in an abandoned shopping mall. Scenes in the mall have horror giving way to humor as the zombies seem quite similar to the people one may see wandering around a thriving shopping center on any given weekend. Actor and writer Simon Pegg takes this concept a step further in his 2004 homage to Romero, the comedic horror film Shaun of the Dead by making the denizens of London seem more like zombies while they're living than they do once they actually start the flesh feasting. With all its moments of levity (including, no lie, an old-style pie fight between bikers and zombies), Dawn of the Dead is still a horror movie at its heart. By today's standards, it lacked realistic special effects. The stage blood in particular looks more like bright red paint than actual blood, which makes the amount of controversy it stirred when released (it was banned in several countries and even several states) seem like overkill. Still, the movie contains some positively chilling moments. It is unsettling at best and downright scary in parts. The movie is also surprisingly emotional, offering the first time we get to see the gradual transformation of one of the main characters into an undead ghoul. Although Romero has made better films in (Night and Day of the Dead) and outside (Martin and The Dark Half) the zombie genre, Dawn is probably the most fondly remembered of his movies. It is a true classic, having stood the test of time and seen a major release remake in 2004. In a genre where good movies tend to be few and far between, Dawn of the Dead is like a breath of fresh air. It is a gory and disturbing movie that is also fun and funny. Campy in a good way, it will be remembered for a long time as one of the most quietly influential horror films ever made.